There's nothing quite like brunch to celebrate Mother's Day. 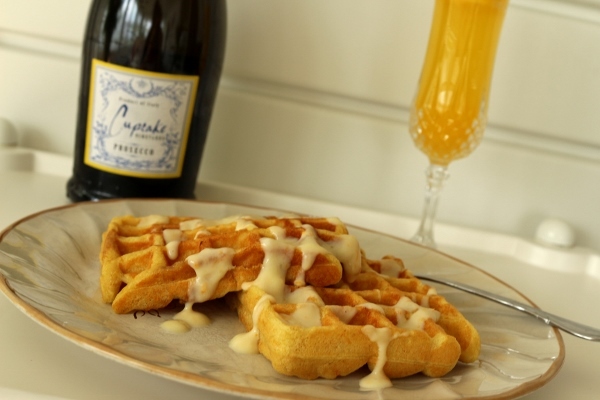 Instead of going out this past Sunday, we stayed in and enjoyed these fantastic homemade waffles and mimosas. 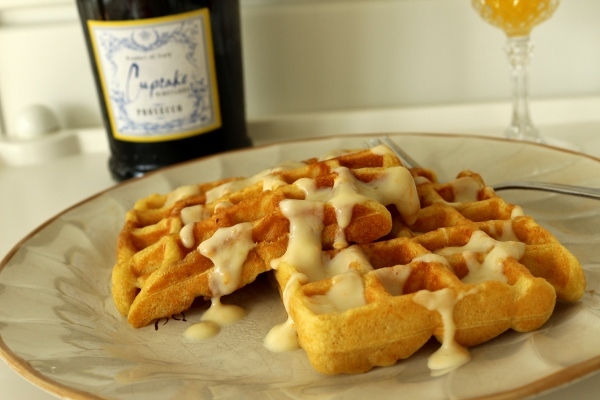 These are excellent for any weekend brunch. 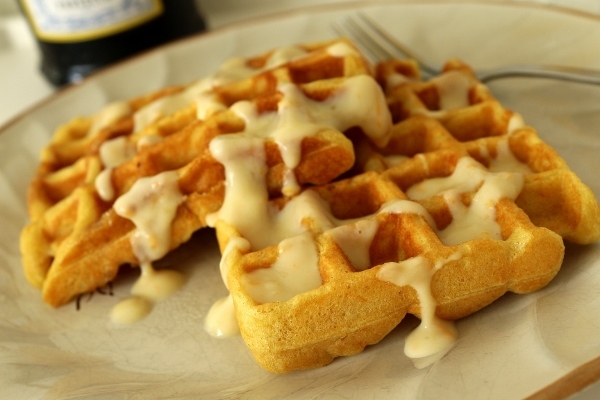 The essence of orange is laced throughout both the waffle batter and the sour cream-orange sauce for topping. There's tons of fresh orange zest and juice in both components. I suggest juicing all of the oranges you use for zesting, and then use that freshly squeezed juice to whip up some mimosas alongside. 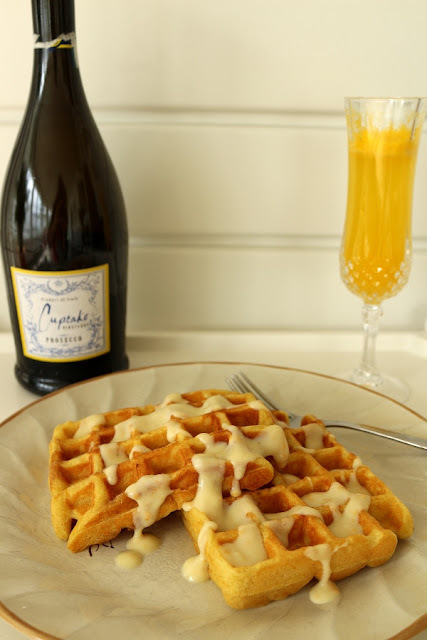 Mimosas served in Champagne flutes really heighten the experience by washing down the waffles with a celebratory cocktail. I served a total of six people on Sunday, so I doubled the recipe. I have a small waffle maker so it took a bit of extra time to cook the waffles in smaller batches, but it almost felt like a chef's table where I was cooking and serving as the waffles finished baking. Alternatively I could have gotten an earlier start and kept them warm in the oven and served them all together, but this worked fine too. My sister said these were the best waffles she's ever had. They are mildly sweet with a really wonderful, fresh orange flavor, and some tang and tenderness from the addition of the sour cream. To make the sour cream-orange sauce, in a small bowl, mix together the sour cream, orange zest, orange juice, and honey; it will be thin. In a medium bowl, whisk together the eggs, milk, sour cream, butter, orange zest, orange juice, and vanilla. In a large bowl, mix together the flour, brown sugar, baking powder, baking soda, and salt. Make a well in the center of the dry ingredients, then pour in the egg mixture. Whisk until mostly smooth, with just a few lumps. 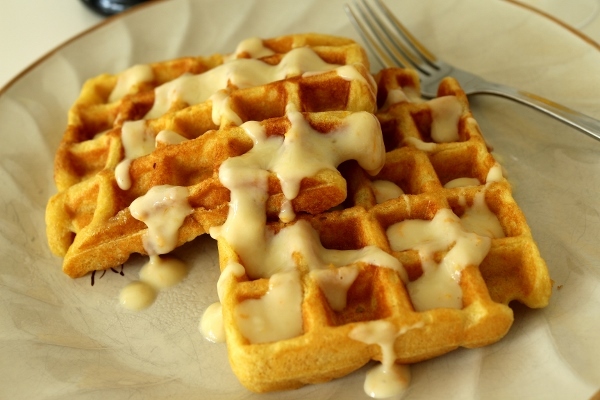 Ladle the batter into the waffle maker, using 1/2 to 3/4 cup (4 to 6 fl oz/125 to 180 ml) batter per batch. Spread the batter so that it almost reaches the edges of the waffle maker. 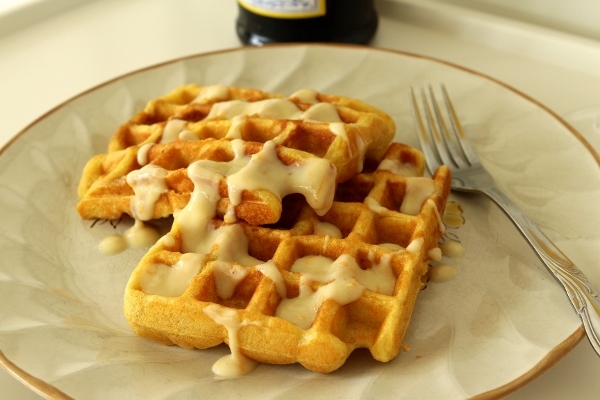 Cook until the waffles are crisp and browned, 3 to 4 minutes. 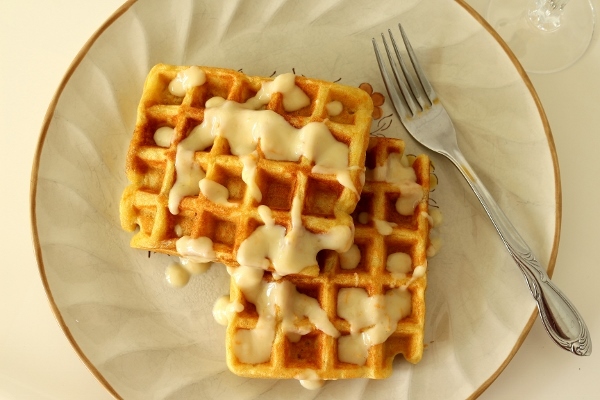 Using a spatula, remove the waffles from the waffle maker and serve the waffles right away, or place the waffles on a baking sheet in a single layer in a 200 degree F oven for up to 20 minutes before serving. Top with a spoonful of the sauce and light drizzle of honey. Cook's Note: The measurements in this recipe are directly from the book, however the ounce and gram conversions are generally not very accurate, especially for the larger values. It seems as though whoever did the conversions just tried to round to the closest number, but in some cases it's vastly different. 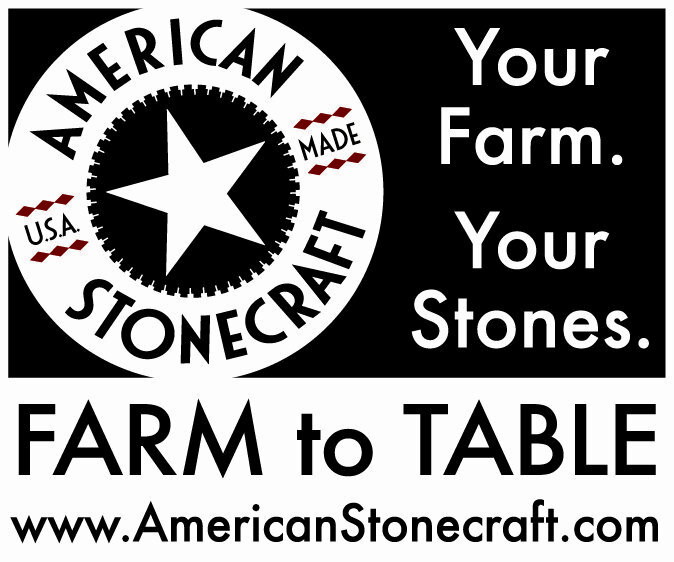 For example 235 grams of flour is closer to 8.3 ounces, not 7.5 (that's almost a whole ounce off! ), but 75 grams of sour cream is 2.6 ounces, so that's at least much closer to 2.5. I'm not sure which measurements were the author's original, however, I use the gram measurements and find those to yield good results.